Still messing around with some video editing software. This is my first attempt at a slide show vid. 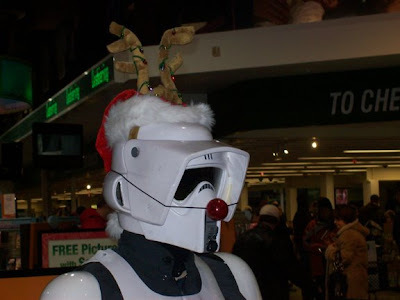 My family and I (DarthMoose74) would like to wish you a Happy Holiday! A while back I dug out an old cheap blue remote control car for a mouse droid project that I still have yet to start. I plan on making two of them, one full size and one small episode 3 size. My cousin came over today and gave me an old remote control car he could never get working. After an hour of checking wires and batteries I got it working. It is an $150.00+ electric version made for heavy 4x4 off road use. I think I will use it for my small mouse droid project instead of the cheap blue one I was going to use. All the car needs now is some new batteries as the current ones don't hold a charge long. A while back I lent my R4 dome out to be assembled and used on another droid for a while, when I got it back I was not happy with what I got so I put it away in a corner to be fixed later. Now that events are winding down and it is to cold to work outside in the barn I have dug it out of hiding. Then I went to the store and got some old time wood clamps. I tore apart the bottom part of the side seam and clamped it together with the clamps and a scrap of wood. The bottom part of the seam is now nice and tight and straight as you can see. I am not going to glue it just yet though, I am going to leave it clamped up for a week so the styrene gets some new memory. The upper part of the seam will be a little more tricky but at least the bottom will now be perfectly round and fit the base ring properly when I do get around to gluing it. I do think R4-MM will be a different color dome wise. I can not find a shade of Mace Windu purple I like LOL. Just a little more fine tuning and he is ready for cosmetics LOL. Here is a vid of the event! 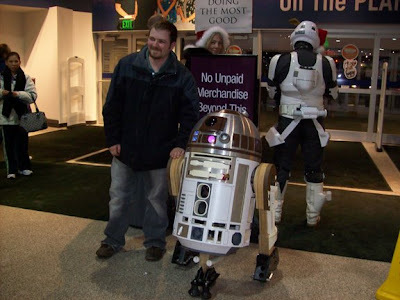 It may be talking to you Patches but it is still not a droid. 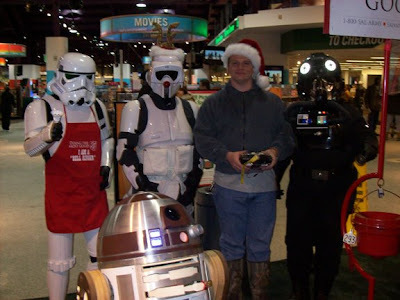 Obi Wan and Patches go x-mas shopping. Everyone was cracking up. We got a minute of the fun. 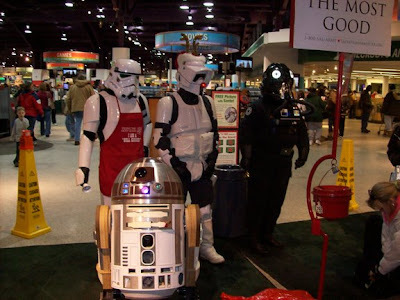 Patches is helping ring the bells with the 501st. He had his hands full so he waves hi with his dome panel instead. No Patches, she is not a droid. "Can I have a toy! PLEASE!" "How about this one! I'll be good I promise!" Jen, Brad, Jayson, and Clay came over to do some more leg work last night. Brad brought his R2 dome over to show everyone that he has been working on. We started off by making a jig to cut the front 3 3/8 hole in the front. It will also be used to cut a 3 1/2 hole in the back side. All the front holes turned out perfect. Here is one with one of Kieth's resin parts in it. Next we lined up the shoulder hubs and drilled the threw holes. Then we used a step bit on the back part of the legs to widden the holes to the next size for the T-nuts. A step bit widdens holes exactly centered but they are not long enough to go all the way threw. We had to come back with a regular bit and finish each hole the rest of the way threw. All 5 sets of legs just need the under shoulder details cut out and they are ready for glue up. It is almost 10pm and it is starting to ice outside so we called it a night and do them next week. I got as much as I could put back on Patches, but today is the day we were invited by the 501st to an event at the SAC museum so what I got done will have to do. We had a lot of fun entertaining the crowds of people and looking at the planes. Look a plane is flying above me! As the days on Coruscant wore on Esoom got more and more depressed. He had wore out his welcome with the owner of the landing pad on the building they had first occupied so the Tree Hugger now rested in a lesser neighborhood but could still faintly see the Jedi temple in the distance. The Ithorian and the Jawa named Lihp spent their days fixing used goods for passers by to pay for the docking fees, ship parts, and parts to try to get Patches functioning again. The ship itself still needed some minor repairs. Around mid day a courier came by to drop of some parts they had ordered. Esoom blankly accepted them and took them inside the ship. As he opened up the new and used parts he to find that one of them was for Patches. Without a further word Esoom disappeared up the lift and into one of the wings of the ship. There stood Patches, nonfunctioning but together, over the past few days Esoom had banged out all the dents and put together the loose wiring. 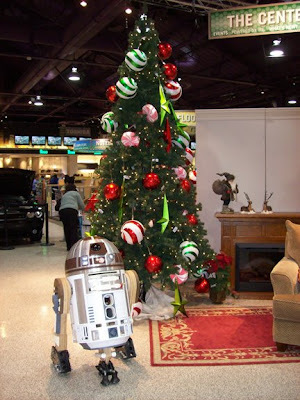 He even managed to paint the droid back to his original Brown and White colors. 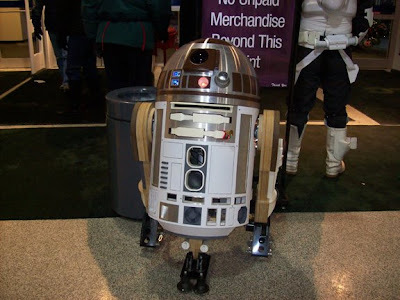 Even with a new coat of paint and body work you could still tell the astromech unit had been threw a lot. Scars and scratches could still be seen in certain areas. This is the part Esoom had been waiting for, a new motivator. The Ithorian’s long fingers gently put the part in place and hooked it up. He switched on the power and the new front logics barely began to twinkle. After a few seconds the lights just stopped, Esoom checked over all the connections again... nothing. 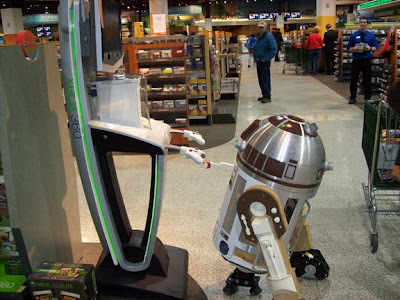 He then pulled the motivator out and made sure it was not defective but everything was fine. Defeated the Ithorian just sat there blankly looking at the battered motionless droid. “Excuse me sir, but you have an incoming message from the Jedi temple.” The pilot droid number 4791 said as it entered the wing. “Yes, yes, transfer it down here.” Esoom said sullenly. “Roger, Roger! 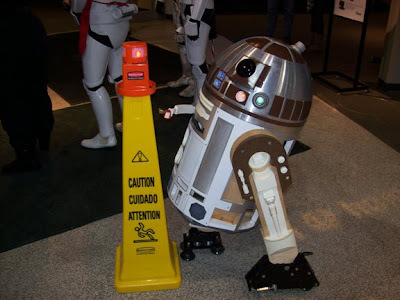 : the droid said as it headed back to the bridge. After a moment Esoom got up and went to a wall console and push a few buttons. A staticy image of Master Yoda appeared on the screen. “Show up you did not when I summoned you days ago.” Yoda said. “That may be easy for you Jedi but not so easy for others...He was more than just a droid...he was my friend.” Esoom said wincing. “Yes master, but only for a while.” Esoom said turning off the transmission before Yoda could reply. Esoom took his time getting to the temple but eventually got there. Climbing the long stairs on the sunny side of the temple a familiar Ithorian Padawan was coming down in the opposite direction. “Good to see you my Ithorian brother.” The Padawan spoke reaching out to shake Esoom’s hand. “Nice to see you again as well” Esoom said forcing a smile. The two of them proceeded to the entrance of the room of 1000 waterfalls. As the doors wisked open the smells and sounds assaulted Esoom’s senses. 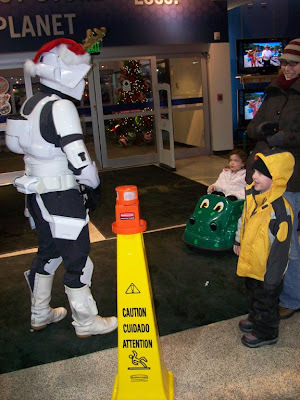 Roron pulled out his Lightsaber so Esoom could see it. “I depend on this weapon with my life. I clean it, repair it, and keep it in peak operation. If it were to get destroyed I would not be sad because it is just a tool. I would just build another one.” Roron then put the hilt back on his belt and began walking threw a grassy area toward where Esoom remembered the Bafforr trees to be. When they reached the area Esoom could hear the trees talk to him, he felt like he was home near Ithor again. The stress and heartache he felt melted away. “I will my friend, thank you for your kind words.” Esoom said as the Padawan left. Esoom then sat beneath the largest of the trees and closed his eyes. Soon he was lost in deep positive though with no dark visions to speak of. He felt like his old self again. “Clear your mind is. Good to see it is.” Came a voice next to Esoom. The Ithorian opened his eyes to see Master Yoda seated in front of him. “Good it is to hear yes.” Yoda chuckled. 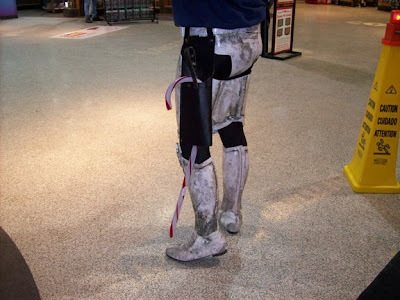 “That does not mean I will give up on my droid though, we have been threw to much. I will still try to fix him but I will start my life's mission at the same time as well.” Esoom said with much power in his words. Later that evening after much discussion with Master Yoda Esoom returned to his ship where Lihp was packing up for the night. “Lihp happy! Lihp go eat and sleep now!” the little Jawa said as he ran into the ship. Esoom went to check on Patches and tried to boot him up again. Patches’ logics barely flickered and were almost to dim to see. 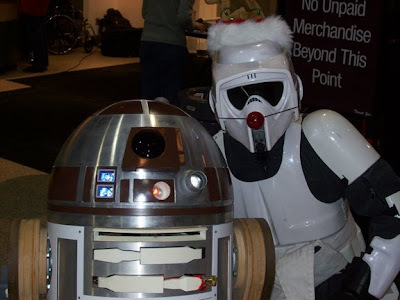 Esoom sat next to the droid and put a hand on his dome. “Now lets get to work.” Esoom said picking up a hydro-spanner with a smile. “ A loud whistle came from behind the Ithorian. and he whirled around to see what the familiar sound was. “Patches! Your alive!” Esoom exclaimed. 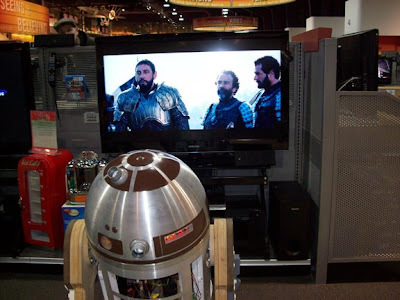 The droid chirped and whistled in delight. His new logics light up brightly. 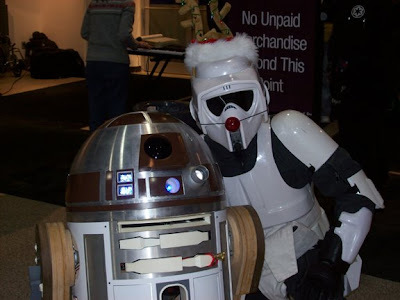 The two of them worked together threw the night and into the morning with the rest of the droids until the Tree Hugger was fully repaired. The next afternoon the ship lifted off for Orto. 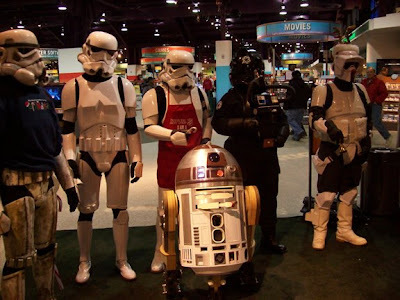 Esoom, Patches, Lihp, and the Pilot droids had many adventures over the next few years, saving planets and people from the ravages of heartless people, thugs, and corporations out to make a credit at any cost. Not everything went according to plan but they stayed true to there goals and meet lots of new friends and enemies along the way. Esoom was finally welcomed back by his people 5 years later but he only ever stayed long enough to visit once or twice a year. 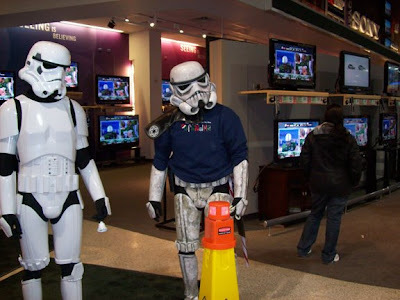 He was to focused on saving other planets to stay long. Everything was going pretty good for the group of The Tree Hugger until about the 10 year mark when the start of the Clone wars began. But that is another story for another time. The tempature is getting colder so I rearanged the garage to have more room and tarped half of it off so I did not half to heat the whole thing. The other day Clay brought over his box of used motors he got from work to share with the rest of the R2-Central group. Now we will have plenty of backup motors LOL.